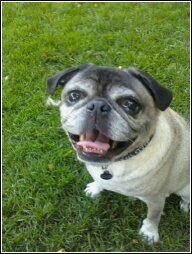 I write a lot about my furry family but the focus on my blog since I adopted him has pretty much been given to Papa Pug. Well deserved attention. Calamity Jane (Janey) is a special little girl to me. She is so beautiful with her gray fur and bright green eyes. I adopted her from the SPCA. I went in to look at kittens when I was feeling like I needed the comfort and warmth of an animal in my life. I went to the SPCA with my Lululemon raincoat on. They had just gotten a bunch of very small kittens in and had them loose in a little room until they figured out where to put them all. I bent down to play with the kittens, wondering how I could possibly choose. I knelt down to touch them all and Janey climbed into the hood of my coat and remained there the entire time I was looking at the other kittens. She pretty much picked me. We’ve never looked back – although we had a bumpy time of it when I brought PapaPug home! She wasn’t terribly happy at first. Janey got her name from the HBO series Deadwood. 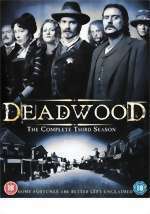 Deadwood was cancelled because of the cost of production. The set was so accurate that the cost was astronomical. If you have not seen it yet – RENT it. Dont wait, do it now. Give yourself a lost weekend of Deadwood. Download it, borrow or steal it. Just watch it. The characters are raw. Believable. Every single one of them. The original draw (for me) was the fact that I had already blew my way through hours of Sopranos, Six Feet Under, Weeds and Rome and Deadwood had a beautiful actress in it that I love, love and love a little more. Miss Molly Parker. My oh my! She is actually from a town not too far from where I grew up. Maple Ridge. In Deadwood she played Alma Garrett Elsworth. High society woman addicted to the drug of choice in those times … and darn it if I cannot remember the name of that drug. Blogging friends? Lurkers? Do you remember? Anyways, one of the characters was a dirty looking woman (not in the good way) named Calamity Jane. I kept saying to my bestie Chico that there was something about her – something underneath the filth and dirt that was kind of hot. Here is a picture of her in character and picture of her as herself. Not bad eh? Her real name was Robin Weigert. Here is a better picture of her. Do you see my point now? =) Nevertheless Janey was named after her. 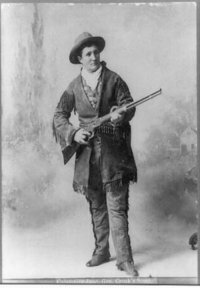 According to Wikipedia Calamity Jane was best known for her claim of being an acquaintance of Wild Bill Hickok, but also for having gained fame fighting Native American Indians. She exhibited kindness and compassion towards others, especially the sick and needy, but she was an alcoholic and traded sexual favors for money. This contrast helped to make her a famous and infamous frontier figure. In Deadwood she was gay. Yup, gay. And she looked after the Prostitutes, helping to keep them safe. I think thats all today folks. A crash course in Calamity Jane. I hired a dog walker for Papa through Craigslist. Briannagh. Brilliant young girl from Australia. Big heart. Big adventurer. And not a bad photographer! Here are some pictures she took of my babies before she left us to continue her adventure in Big White.